This is from Raymond Blanc’s “Cooking For Friends”. It is an excellent cookbook, and thoroughly reliable, one of the few I feel I can cook from when entertaining without a trial run, but then I quite enjoy winging it when cooking sometimes. The only exception is his egg puddings – crème caramel etc. The recipes are great, but the timings all wrong for my oven. Those need working out first. His tarte tatin method is the best I’ve ever used. Sweet shortcrust pastry – sufficient quantity to to make an 11” tart. For me this is usually one packet from the super-market, but happy pastry makers can of course make their own. 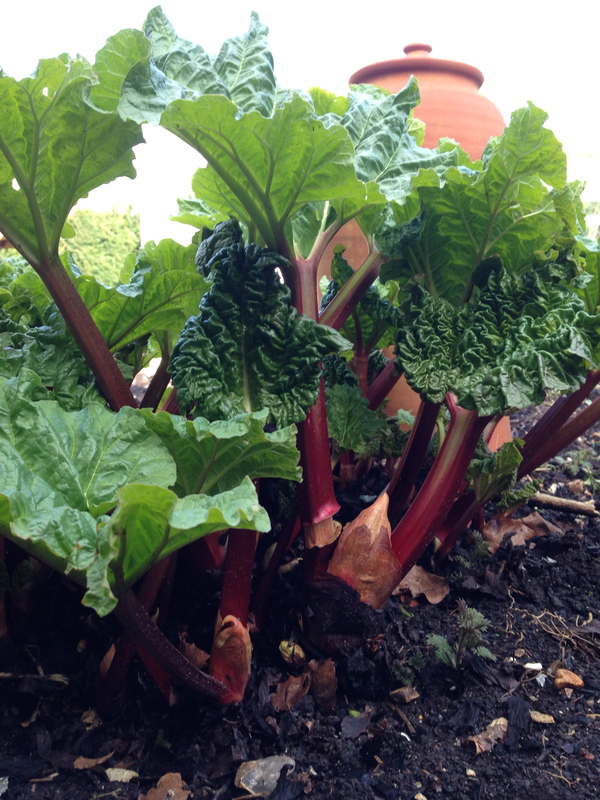 14oz / 400g rhubarb, washed, peeled (if needed) and chopped into ¾ inch pieces (2cm). Butter a 11inch (28cm) shallow tart tin (one with a removable base or you’ll have a headache at the end turning out) well. Let the pasty get to room temperature. Roll the dough out on a well-floured surface until you have a circle big enough for your tart tin. Rest the dough for a few minutes (2-3). Put the dough in the tart tin, and press it in to fit the shape. Don’t stretch it, sort of lift and place then gently push. Stretched dough will just shrink again in the heat, and crack. I don’t trim at this point so that if it shrinks a bit in cooking I can make it neat at the end. Put the lot on the hot baking sheet, put in the hot oven, and bake for 10minutes. After 10 minutes take out of the oven, take out the baking beans and grease-proof paper, and put the case to one side. Bring to the boil the sugar and water in a saucepan, tip in the rhubarb and cook on a gently simmer for about a minute only. Strain the rhubarb (you don’t need the sugar water now) and put to the side. Beat the egg yolks and sugar together with an electric mixer until pale and creamy, and about tripled in volume. This takes at least 10 minutes – more like 15 with my mixer. Mix in the double cream and lemon zest. Scatter the rhubarb pieces evenly over the base of the pastry case, and pour / spread over the lemon cream. Put the whole thing back into the oven (same temperature) for 25 – 30 minutes. You can sprinkle extra caster sugar over the top of the tart if you like when it’s finished cooking and you get it out of the oven, but it is still hot. The original recipe says to do this, I don’t. Let it cool in the tin, trim the excess with a sharp knife and a kind of diagonal sawing motion against the edge of the tin, and then get it out. I put the whole thing on a tin of beans (it doesn’t have to be beans) and gently free the outside ring of the tat tin, and let it drop down. I then gently free the base from the pastry with a cake slice and slide it carefully on a large flat plate.